Morels, known to some people as sponge mushrooms, are in the genus, Morchella. They are included in a large group of fungi known the ascomycetes. The literal meaning of the word "ascomycete" is sac fungus. This is an appropriate name since fungi in this group form their spores in microscopic sacs. The spores of morels burst from their sacs, which are within the pits of their caps, and are carried by the breeze. Where can someone find these delicacies? Many a mushroomer will give an extremely vague answer, if they give an answer at all. Stream and riverbeds, wooded areas, around fallen timber that has been decaying (look for dead elms), and don't forget to look within brambles and thick underbrush. Tall weeds, limbs, and grass can be brushed aside with a long stick. Once you spot a morel, look for more in that same area. Collect your goodies in a paper bag or basket (storing mushrooms in plastic bags promotes decay). Anyone gathering and eating mushrooms should exercise caution. Be absolutely sure of the identity of each specimen collected. Some mushroom species are poisonous. Don't eat excessive amounts even though you are sure of the identity. Certain individuals might become sick (possibly an allergic reaction) after eating a mushroom that is considered edible. The Iowa State University Plant & Insect Diagnostic Clinic can help you to investigate and confirm if your plant has this disease. Please see our website for current forms, fees, and instructions on collecting and packing samples. Contact information for each states diagnostic laboratory for U.S. residents can be located at the NPDN website. If you have a sample from outside of Iowa, please DO NOT submit it to the Plant & Insect Diagnostic Clinic without contacting us. 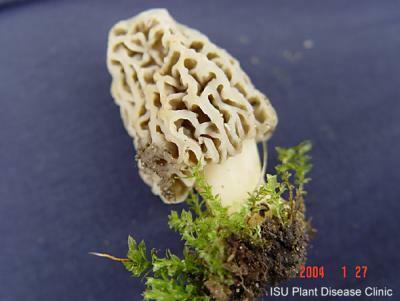 Remember the ISU Plant and Insect Diagnostic Clinic Identifies Mushrooms, Not edibility https://www.ipm.iastate.edu/content/isu-plant-and-insect-diagnostic-clinic-identifies-mushrooms-not-safety. We do not make recommendations about whether you should eat them. For information on the Morel mushroom certification workshop email pidc@iastate.edu, or check for updates in this page.